professional development opportunities for teachers to keep high-school/middle courses up to date with the latest discoveries in science. 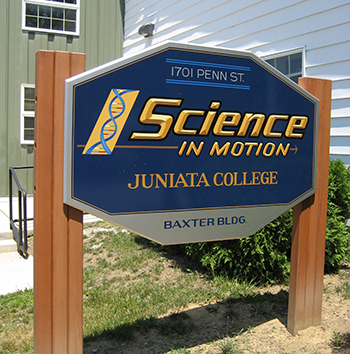 SIM was founded at Juniata College in 1987. There are currently 10 colleges and universities in Pennsylvania serving over 200 schools. All of this is at minimal cost to schools, thanks to our support from the Commonwealth of Pennsylvania, and businesses such as GlaxoSmithKline, Kish Bank, PNC Bank, Lititz Mutual, the National Science Foundation, the Pennsylvania Department of Education, and D C Goodman & Sons Inc.
Support Juniata College Science in Motion (SIM) when you search the Web or shop online with GoodSearch.